According to a forecast by Deloitte, combined turnover of the UK hotel industry will rise to 257 billion British pounds by 2025. Hotels are fully aware of this truth. They are always eager to embrace the latest technological advances to provide better services to their guests. However, unlike hotel chains that can afford such technologies, the scenario remains different for small hotels and motels. For them, the emphasis lies in rendering a memorable guest experience with their exemplary customer service and out-of-the-box marketing strategies. However, scanning of UK passports has now become easy and affordable with Accurascan. Small hotels are vastly reaping its advantages by ensuring quick guest check-in service. 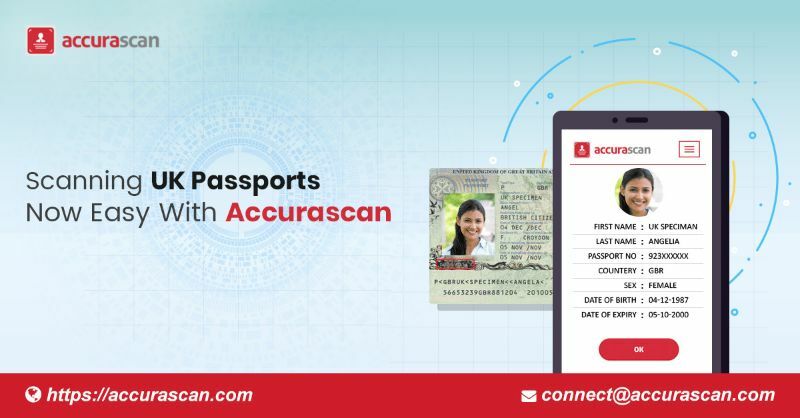 Although the Accurascan app is not just limited to scanning of UK passports, the availability of an SDK that allows easy customization to suit the need of different businesses has enhanced the possibility of its widespread use. Also, the SDK helps in easy integration of the Accurascan app with any of the existing apps that a business use for streamlining its business operations. Thus, not only just hotels, any business operating within the United Kingdom can ably use the app to meet their scanning needs for passports and other vital documents without having a hole in their pocket. With easy integration with an app that accurately scans cheques and invoices, one can have a hand-held scanning device which can scan every document that they have to deal with on a day-to-day basis. While Accurascan enables easy scanning of UK passports and other relevant documents with a mobile device, the availability of Accura Web API further expands its use by facilitating document processing on a secured cloud server. This, in turn, facilitates any authorized user to have a quick access to the documents from any place. One can try the Web API for free for a period of 30 days to get an idea about how it extends the applications of the Accurascan app to a significant extent.